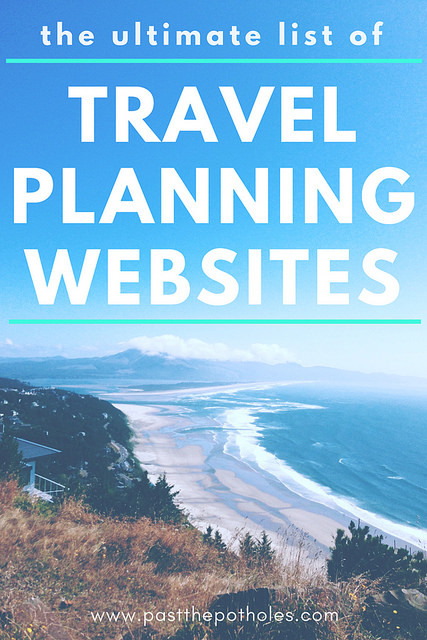 The Ultimate List of Travel Planning Websites to Rock your next Vacation! There are so many different travel planning websites out there it’s hard to know which ones to use. I used to be a sucker for all those “10 Best Travel Apps” type posts. I would download them all and immediately try them. I’ve been known to have 3 or 4 different trip planning tools working at once, trying to decide which is the best and ultimately being unhappy with them all. Most often they offered nothing different, just shiny new packaging. I have, however, come across a few gems. This post won’t be full of websites that do the same as all the others. I am including only those travel planning websites that I personally use with success. You will even find tips on when to use each one. Trying to search for the best deals can leave you wasting hours staring at your computer screen. Believe me, I am that person that has spent hours upon hours scouring the internet for the best price when booking a vacation. My goal is to save you that same headache! We have compiled a list of the best travel tools we know. These are travel websites that we use ourselves regularly. We’d love to hear about any others from you! Everybody has a favourite flight searching tool and we all know that you should cross-check prices on multiple sites. Here’s the thing: I have spent hours comparing prices, trying different dates and different combinations of airports. Every time, Google Flights gives me the best prices. In addition, it has some amazing features. Put in your dates, choose your departure location and click ‘Everywhere’ to see prices around the world. Check the calendar to see if flying just a day or two earlier/later could save you hundreds. Discover if booking separate flights will be cheaper than a round trip. I simply haven’t found a better flight search tool! Go ahead a check a few others (friends love Skyscanner and Momondo) but be sure to check Google Flights. I book the cheapest flight options available (almost always found on Google Flights) but often there are multiple sites at the same price. More often than not Orbitz is one of the cheapest options and, when that happens, this is where I book. When you book flights on Orbitz you will earn 10% back as ‘Orbucks’. These can be used against future hotel bookings. I’ve already received a free night’s hotel through this and have over $50 waiting to be used in the future! You never what could happen on the road. Don’t spoil your vacation or break the bank with a small accident. Honestly, we don’t usually buy travel insurance but when we were hitting the road for a full year we decided it was the smart thing to do. Between my bag (and contents) getting stolen in Peru and Terry’s tooth breaking in Spain our decision has definitely been validated! It was surprisingly cheap and easy too. We just selected the countries or continents we would be visiting, clicked on the level of coverage we wanted and pressed “BUY”. When we stay somewhere for more than a week, we like to rent a full apartment. The kitchen allows us to save money on food and it’s simply more comfortable. Nothing beats AirBnB for this. If you’ve somehow missed this and don’t already use AirBnB, use the image above to open an account and get $45CDN off your first booking! When possible, I like to use hotels.com to book accommodation. For every 10 nights I book, I receive one free (up to the average of the 10 paid nights). For comparison purposes, this essentially works out to a 10% discount for each booking. They’ve been broadening their accommodations lately too and now have a. number of hostels and apartments available. It’s not always the best deal though so be sure to check the two below before booking anything. While I like to collect free nights on hotels.com, it isn’t always the cheapest option and doesn’t include as many budget accommodations. Quite honestly, I often find better deals on booking.com. In addition, most of their accommodations include free cancellation. This comes in really handy when plans need to be flexible. This year we’ve been doing some housesitting so it’s great to know we can cancel if a great house sit comes up! Pinterest is pretty much my favourite place to look for ideas about anything! Travel is no exception. I consistently find more detailed, relevant articles and websites to help me plan where to go, what to do and how to do it all. The added bonus with Pinterest is the ability to save everything in one place by making a dedicated ‘board’. This is basically a digital folder to save all related files so you can come back again and again. Word of warning: save interesting things when you see it, there’s a good chance you won’t find it again later! This is my favourite website for finding and booking tours and activities. The tours we have booked were all priced at the exact same price as booking directly through the individual companies (believe me, I checked) and the booking is so quick and simple. Viator has a huge inventory and so, when I can’t find a tour on Get Your Guide, this is my next stop. If it’s not on Viator, it’s not anywhere! I find the prices can be a little higher than Get Your Guide so this is my second stop. It’s also a great place to find ideas of places to go and things to do that you could do independently. Kiwitaxi is an excellent airport transfer service available in over 100 countries! We only recently discovered this when searching for options in Istanbul. Not only were they far cheaper than the hotel transfer services and other airport transfer companies, they were around the same price as if we had just hopped in any questionable taxi off the street. We booked them for our return journey and the driver even showed up early in our hotel lobby. Definitely our first choice from now on! Whenever possible, we prefer to rent a car. Not only does it give us far more flexibility and freedom in our schedule, it can often be cheaper than using public transportation! RentalCars.com is a great website that will search over 900 rental companies to find the best price for you. I did plenty of comparisons the first time I used them and it really was the best option! Rome2Rio is an amazing website when still in the planning stages. If I have no idea of the best way to get somewhere, this website gives me all the options (including buses, flying, trains, boats and car) and an estimated time and cost of each route. I then have a better idea of what to look more closely at. When in Europe, GoEuro is an excellent tool for booking overland travel between destinations. Unlike sites such as Eurail, it searches trains, buses and flights, and gives you the cheapest and fastest options available. I’ve used Google Maps for years to figure out times and distances between locations when travel planning. Google My Maps takes this to a whole new level. Save each location you are interested in visiting. Number them, colour code them and organize them in categories. Add travel routes and directions between destinations as well as notes from your Pinterest research. You can save this map, share it with others and export or print. If you’re going to be moving to different location on your trip, this is a game changer. If you’re anything like me you come home from vacation with thousands of photos. The question is, what to do with them? Digital is good but it’s not so easy to share with friends and family. I’ve made numerous photo books and they are definitely my favourite method of recording my travel memories! I have a photo book for our wedding and honeymoon in Greece and England, and another for our two years living in Mexico. Photobooks also make fantastic gifts! After family visited us in both Mexico and Trinidad, they each received their own small phonebook of the vacation. When we’re not around for the holidays anything that can be created and sent online is a win-win in our eyes! Save this page for later!